“WE are gathered today in remembrance of some of the members of the legal fraternity who are no longer with us. Today’s proceedings are indeed unique in nature, for this Court refers to eight former Justices of this Supreme Court and seven President’s Counsel who have done yeoman service to the legal profession. They who has been noted for their integrity, impartiality and fairness,” said Chief Justice Asoka de Silva at a reference made to late Justices and President’s Counsel at the Supreme Court Complex recently. The eight Justices are Justice E.A.D. Athukorale, Justice K.M.M.B. Kulatunga, Justice M. Jameel, Justice Mark Damien Hugh Fernando PC, Justice P. Ramanathan, Justice Theodore Albert de Silva Wijesundera, Justice Raja Fernando and Justice Wilmot Dias Gunasekera. We pay this tribute with utmost respect and honour to- Justice E.A.D. Athukorale - He was one of two lawyers who practised in the outstations, who were appointed to the court of appeal on its establishment under the 1978 Constitution. An old boy of Ananda College he completed his higher education at Ceylon Law College and as an external student of the University of London. Justice Athukorale was called to the Bar in 1949 and started off with a strong area practice particularly in the Ratnapura Bar. His knowledge and experience of civil law helped Court of Appeal Bench to expedite backlogged civil cases. He earned a reputation for particularly expediting very old cases. He was appointed as a judge of the Court of Appeal by President J. R. Jayewardene in 1978. In 1982 he became the President of the Court of Appeal and later appointed as a Judge of the Supreme Court. He was involved in landmark judgements including the often cited judgement in Amal Sudath Silva’s case. Justice K.M.M.B. Kulatunga - had his early education at St. Bernadette’s and St. Joseph’s and thereafter entered the University of Ceylon in 1953 and graduated in 1955. He passed out of Law College in 1956 and took oaths as an Advocate in 1957. He joined the Attorney General’s department in November of 1959 and was promoted to the position of Senior State Counsel. Justice Kulatunga then proceeded to Cambridge where he followed a Post Graduate course in International Law and was awarded a Master Degree. From 1982 he functioned as the Solicitor General and took silk in 1983. On several occasions he acted for the Attorney General when the permanent holder of the office was out of the island. Justice Kulatunga also acted as the Legal Draftsman and as Additional Secretary to the Ministry of Justice. He was appointed a Judge of the Supreme Court in 1989. He chaired the Bindunuwewa Commission and during retirement authored the renowned book titled “Disorder in Sri Lanka” (2001). He passed away on June 3, 2010. He was known to take each problem on its merits, never compromising the dictates of Law in Favour of expediency. Justice M. Jameel - Received his early education at Trinity College, Kandy and entered University of Ceylon to follow a degree in science. Following graduation he entered the Law College. He was known for his distinguished record at the Law College. He was called to the Bar in 1950 and after ten years of practice Justice Jameel joined the Judiciary in 1960 as Magistrate. He steadily rose up the rungs of judicial ladder and in fullness of time was appointed to Court of Appeal and then to the Supreme Court. He was an esteemed Judge of the Supreme Court and also a Member of the Constitutional Council. He was also appointed as Ambassador to United Arab Emirates. Coming from a multi cultural background he was known for his balanced approach to problems. He passed away on September 11, 2009. Justice Mark Fernando PC- Following the footsteps of his grandfather the late Justice V.M. Fernando and his father the former Chief Justice H.N.G. Fernando, Justice Mark Fernando too became an illustrious, well conversant learned Judge of the Supreme Court. His bright academic career started at St. Joseph’s College Colombo 10, then entering the University of Ceylon, Peradeniya he obtained a first class honours for his Bachelor of Law. Immediately afterwards he entered the Law College of Ceylon and apprenticed in the Chambers of C. Ranganathan QC and was called to the Bar on July 30, 1963.He specialized in Constitutional law matters. He took Silk in 1985, just three years before he was sworn in as a Judge of the Supreme Court. He was the youngest President’s Counsel to be sworn in. He was respected for his integrity and simplicity. His judgements reflected the true principles he stood for. Before his premature retirement he served as a Judge of the Asian Development Bank Administrative tribunal. He is considered to be one of the sharpest legal minds Sri Lanka has ever produced and was mentor to thousands of law students. Justice P. Ramanathan - He was born into a conservative Hindu Family, Justice Ramanathan received his early education at St Joseph’s College, Colombo. He continued his studies at Montford High School in South India and thereafter set sail to the United Kingdom to further his education. After a brief spell at St. David’s College, in Wales, he was called to the Bar by the Hon. Society of Gray’s Inn. He returned to Sri Lanka as a Barrister, and was admitted as an Advocate of the Supreme Court. After a brief spell at the Private Bar, he joined the Attorney General’s Department in the late 1970s where he was well-known for his sense of fair play whether prosecuting in the Assizes or arguing Criminal Appeals in the Court of Criminal Appeal on behalf of the Attorney General. His tenure as a Judge began in the High Court, soon thereafter becoming Judge of the Court of Appeal, President of the Court of Appeal and Judge of the Supreme Court. Rama as he was affectionately called was a keen sportsman and after his retirement he functioned as a Governor of the Western Province of Sri Lanka. Justice Theodore Albert de Silva Wijesundera - The Late Justice Wijesundera was a product of Nalanda College, Colombo and Dharmasoka College, Ambalangoda. He was called to the Bar in 1945 and joined the Attorney General’s Department in 1950 as a temporary Additional Crown Counsel. He was appointed as a Crown Counsel in 1951. from 1957 to 1958 he served as a legal assistant to Local Government and Cultural Affairs Ministry on secondment. He was later appointed Commissioner of Assize in 1994 and to the Supreme Court. After his retirement he was appointed as Chairman of the first Commission on Bribery and Corruption. Two of his daughters Deepali and Menaka both are presently High Court Judges. Justice Raja Fernando - a product of Maris Stella College, Negombo, St. Anne’s Kurunegala and St. Joseph’s College, Colombo. He entered the Law College and completed legal education to pass out as an Attorney in 1971, the same year he was admitted to the Bar. He joined the Sri Lanka Army in 1973 as a legal officer in the rank of Captain. Thereafter he joined the Attorney General’s department (Criminal Division) in 1975 as a State Counsel and prosecuted in several High Courts in the island. In 1987, in addition to his duties as a State Counsel he was seconded for service to the Sri Lanka Navy as Judge Advocate in the rank of Commodore. In 1992 he was appointed as a Judge of the High Court. Later he was stationed at Commercial High Court of Colombo. Whilst handling judicial office he obtained leave for two years and served in Belize as Director of Public prosecution. In 2000 he was appointed as a judge of the Court of Appeal. And in the year of 2004 he was elevated to Supreme Court bench. During this time he was appointed by the United Nations Organization, as a Judge of the special court for Sierra Leone. Justice Raja Fernando as a Judicial officer tirelessly worked to reduce the backlog of cases. He is renowned for his disciplined lifestyle and his simplicity at work. He believed in actions, and conduct rather than lengthy words. I believe, which qualities encapsulated in him through his military training and his personality. 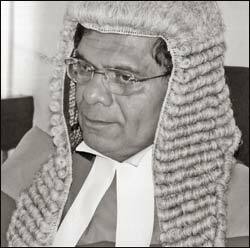 Justice Wilmot Dias Gunasekera - He received his early education at Convent of St. Mary Immaculate in Matara and Richmond College, Galle. After obtaining a Bachelor of Law Degree from the University of London and completing his Advocate examinations at the Ceylon Law College, he served in the Chambers of N.E. Weerassoriya QC and was called to the Bar in 1946. He was appointed Judge of the Supreme Court in 1974. He was also a former Secretary of the Bar Council, lecturer and examiner at the Ceylon Law College. Late President’s Counsel H.L. de Silva - Hailed as the “Hultsdorp Lion” passed away in 2009 after an illustrious legal career. President’s Counsel Desmond Fernando former President of the Bar Association of Sri Lanka was also the only Sri Lankan to hold the prestigious post of President of International Bar Association. President’s Counsel Tyrone Fernando- An Oxford graduate, Barrister, former Foreign Minister and Governor of the North-East Province was also a Presidential advisor. President’s Counsel A.L.M. Hashim- He was a Barrister and former Ambassador to Saudi Arabia. President’s Counsel M. Kanagasunderam who served in the Attorney General’s Department for 15 years thereafter joined the private Bar. President’s Counsel A.K. Premadasa, former Chairman of the Press Council of Sri Lanka and also the Chairman of the Associated Newspapers of Ceylon Limited (ANCL) was a dominant figure at Hultsdorp for decades. President’s Counsel A. M. Marleen who after 40 years of active practice, then went onto join the foreign service as an Ambassador to Saudi Arabia.